I am continually fascinated by the notion of self-organising teams, how they motivate themselves and how you can create an environment that is conducive to self-motivation. Unfortunately my experience is that self-management works for the minority and is highly rewarding and highly effective, but it does not work for all. Bystander Syndrome is prevalent and too often the plants do not get watered. Why don’t developers water the plants? So, recently I ran an experiment and discussion on the general low involvement and engagement of extra-curricular activities. In particular events that are considered to be core to the effective working of the company but are not explicitly part of your core objectives. The premise of the experiment is that we have become more focused on benefit to ourselves or benefit to our local teams, rather than the benefit to the wider organisation. For those out there ready to point out that an experiment requiring voluntary attendance already excludes those that are more focused on themselves – you got me! I stacked the deck in favour of the more social minded of the organisation. Our organisation is very much built around self-organisation and we are expected to manage our own time and priorities. However, we have a number of activities that are ‘global’ in scope: some where the time spent is voluntary and expected to be worked above and around billable time. Or facilitating other team’s retrospectives which is billable time but can conflict with your primary team priorities. Even our Guilds, which are groups of people based around a single focus or competency have an implied ongoing commitment to attend regularly. Finally, “Lunch and Learns” or bookclubs where there is opportunity to share ideas and learn from colleagues, which is a core cultural goal of the organisation but is done as part of your personal development and on your own time. All of these activities could be considered to be valuable to the organisation and in most cases to you personally (directly or indirectly), but all require an investment of time and effort. My observation is that in many cases the involvement is diminishing either proportionally or absolutely as we grow. Attendance at lunchtime events seems to be diminishing, involvement in volunteer groups like guilds is a challenge to the organisers and maintaining membership is probably the number one challenge. The goal of the discussion was to identify ideas for how we maintain or stimulate these activities and how to involve a wider audience, preferably without putting a greater burden on a few (and often the same few people), and without directing people to attend, which is counter to our culture. We played a game loosely based on the ‘Public Good Game’ We set up two relatively large groups. All participants were given $10 each and the game is played in rounds. Each round players can contribute as much or as little as they like to ‘a pot’ but the total contributions will be combined and then a pre-determined bonus would be added to it. One team got a 30% bonus the other team a 40% bonus. All players were asked to choose how much to contribute, in the 30% team the contributions were visible, in the 40% team the contributions were secret. If you apply pure logic, the maximum gain is obtained by everyone contributing fully, that way everyone gains a lot. But an individual can work out that by opting out and reducing their individual contribution they can benefit at the expense of others. Over the course of a number of rounds as more and more people realise that others are not contributing fully, they will either call the others out for not contributing, OR they too opt out and eventually those that are still contributing receive back less than they contribute and at that point system fails as everyone eventually opts out. What we found was that the transparent team reminded each other and kept the focus on the public benefit and maintained a better contribution level, the secret contributions team had two or three participants who were able to benefit considerably at the expense of others by not contributing (leeching from the pot). There was sufficient reward to keep the others motivated although that was diminishing each round. Overall it was the transparent team that benefitted more, but both teams missed out on a huge amount of potential benefit by a focus on personal gain. In the recap there was a suggestion that it was unclear whether the goal of the game was for collective gain or individual gain – e.g. How did we measure the winner? Many of the arguments we heard were around billing, and utilisation. There seems to be a reluctance to use personal time for ‘extra-curricular’ learning, which implies that there is a perceived lack of sufficient personal benefit from involvement in these activities. In other cases such as facilitation and helping other teams people are balancing time spent with their local team against involvement in activities that benefit a wider group. The question is… Which is more important? The challenge for us then is how to change priorities such that activities that benefit the company as a whole are perceived as valuable (not necessarily more valuable but valuable enough to make that effort), or to highlight the benefits to us as individuals resulting from a greater involvement in company wide activities. The conversation that followed created some great ideas, as well as highlighting some of the concerns. 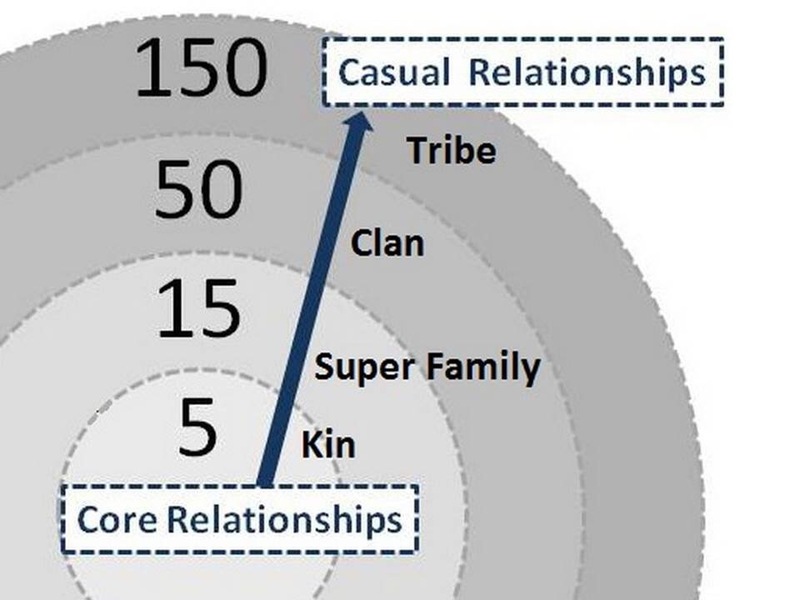 Dunbar’s number is a suggested cognitive limit to the number of people with whom one can maintain stable social relationships. Dunbar has a theory that as groups exceed a certain number approximately 150 people their sense of community diminishes and the group becomes less effective, less cohesive and it is more difficult to self-organise. Many of the issues raised could be interpreted to have their root in the Dunbar number. As we grow we don’t personally know the other people that are presenting at LnLs or the others that are attending the guild meetings. This lack of personal attachment results in a diminished sense of interest, ownership and responsibility, skipping is downplayed as it is only letting down people you don’t know, or an assumption that others will attend. Have fixed times/days for lunchtime activities to regulate number and ensure quality. Invite only those from a sub-group (accept Dunbar’s Number and work with it). Our goal with this experiment was to gain ideas and gain a better understanding of the problem and to share these concerns with a wider audience, we were not aiming for a solution to the problem just a start to the conversation. Next Post Are you working too much?